If you have been a regular recipient of remedial massage over the years then there is a reasonable chance then at some stage you would have been offered the opportunity to try dry needling. More and more massage (and for that matter physiotherapists) in Sydney have been trained to provide dry needling. Some of the therapists who work with Inner West Mobile Massage are trained to provide dry needling treatments. But what is dry needling, is it different to acupuncture and is it effective? A technicial definition is that dry needling uses a variety of needling techniques to initiate change in soft tissue dysfunction which are the results of physiological loading causing inflammation or irritation of the soft tissue. A more normal description is that dry needling is used to de-activate trigger points in the muscles (for information regarding trigger points then there is more information here). The insertion of a needle is considered as being an effective way of relieving the pain and discomfort which may be attributable to the trigger point. For a dry needling treatment, then a thin needle is inserted into the trigger point (which the therapist has identified through palpation). If the needle is positioned correctly then there will normally be a local twitch response, an involuntary reflex as the muscle fibres of the taut band of the trigger point contract. As with any bodywork modality, the effectiveness of a dry needling treatment is directly related to the skill of the practitioner. Obviously just sticking needles into the muscles and hoping is not likely to provide good results. The therapists palpation skills and knowledge of anatomy are critical to the success of the therapy. 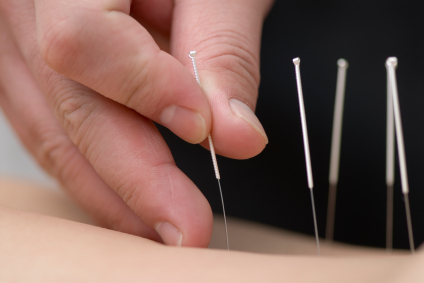 Although both modalities use needles to initiate healing for the body there is a distinct difference regarding the philosophy behind dry needling and acupuncture. Dry needling aims to reduce pain through the de-activation of trigger points. The needles are inserted into the trigger point but they are not left in the muscles for much more than a few seconds. Acupuncture uses needles to enhance energy and chi flow through the meridians of the body. An acupunturist would normally leave the needles in the meridian points for an extended period of time. Now whilst there is a huge underlying difference in the intent of the two modalities, there is also a significant area of commonality. It is often reported that there is an overlap of somewhere between 70-90% for trigger points and the meridian points used by acupunturists. Research on the effectiveness and efficacy of dry needling is fairly limited. Some commentators will argue that many positive findings are based on small sample sized research studies which may or may not have flaws with respect to methodology. One of the major problems is similar to research studies into acupuncture: the skill, training and knowledge of the practitioner is a variable largely out of the control of researchers. Also most practitioners will vary their approach depending on issues that the client presents with and for them, there is no standard treatment. Whether or not dry needling can be clinically proven to provide pain relief through de-activation of trigger points may be considered as being a mute point anyway. The issue is whether it can work for you. If you are interested in trying dry needling then a couple of the therapists who work with us are trained and qualified to offer this therapy. Give us a call on 0421 410 057 if you would like more information.